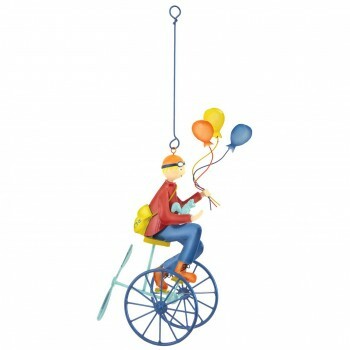 Capturing all the nostalgia and joy of a bygone era, this lovely little fellow designed in France carries his balloons while suspended in the air or sitting beautifully on a shelf. Colourful, rustic, with a touch of kitsch, Triple Balloons purple is a unique keepsake gift for anyone and any occasion. Please note: This mobile is a decoration only. We have one only of this item and can not take back orders.